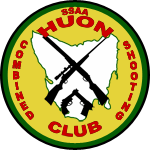 The SSAA Huon Combined Shooting Club is based in the Huon Valley, in southern Tasmania. The club range is in the Forestry Tasmania forest area to the west of Franklin. If coming from the direction of Hobart or Huonville, turn right into New Road in Franklin. Follow this (carefully – the road is gravel, narrow, winding and uphill, with other traffic including forestry vehicles and logtrucks) until you reach the forestry boomgate (about 6 km from Franklin). The boomgate is currently open permanently. Once through the gate, follow the club signs – about 4.5 km to the range. NOTE THAT SMOKING IS NOT ALLOWED IN THE FOREST – except in the designated area at the range. A MAXIMUM SPEED OF 40kph IS RECOMMENDED IN THE FOREST.